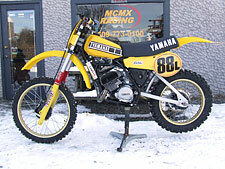 The Vintage Yamaha YZ Forum! 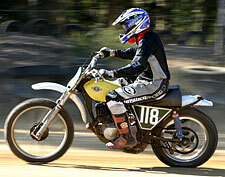 Rick Salazar's 'Team Bultaco' Discussion Group! Cousin Weedy's CZ Discussion Group! 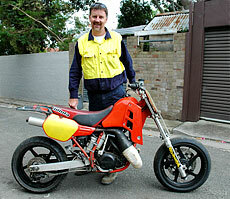 MR: What is your first memorable moment that involves a minibike, motorcycle, scooter? That would have to be when my oldest brother Johnny, who was in Vietnam flying Huey's at the time, sent a Bonanza mini-bike w/ 5hp Tecumseh engine, as a surprise Christmas present to my next oldest brother Christopher. Within 5 minutes of uncrating it we'd setup a makeshift jump using a board and a couple of red bricks, and were jumping the septic tank in the back yard. Who was the biggest enabler that helped you get your first machine? My stepmom recognized that I needed a bike to try to keep up with my older brothers, and they bought me a used blue1970 Honda Trail 70 for $300. 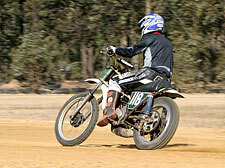 I pounded that poor thing into the ground, eventually cracking the frame under the seat, trying to out-jump my brother Christopher on his 1970 Yamaha DT250. Last year I was told I'm a decent Novice rider and now that more battles have been fought and some have been won in the Amateur division, it's starting to be clear to me that I'm not a beginner anymore. 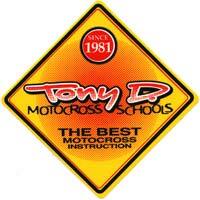 So when do you know when you're ready to move up a class from Amateur to Intermediate or from Intermediate to Expert? I'd say it's very hard to rate yourself, but you know deep-down when you're improving from year to year and if you're a good racing citizen you realize that you need to get out of the NOV class sooner or later or as an Intermediate, move into Experts eventually, but when? So how about we explore the motivations and desires of some riders to move themselves up and the desire of some riders to just stay put until they're moved up kicking and screaming? And how about those riders who just don't know when to move up and so let's maybe explore some categories of riders and come up with my kind of unofficial formula for moving up a division. Sounds like it might be useful, so here goes. 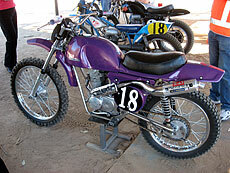 These bikes are 1970 and 71 Yamaha DT1 and RT1 MX's, DT 250cc and RT 360 cc first years of Yamaha's Motocross models. The differences in enduro's are 21 inch front wheels, knobby tires, high front fenders, front number plate, expansion chambers w/o any mufflers, different air boxes, cylinder porting, bigger carbs, higher compression heads and closer transmission ratios. The two fictitious ads (in this article) are representative of the hundreds & thousands of ads motorcycle enthusiasts/collectors/dealers read. Specifically, they address two over-used and often widely interpreted concepts - "collectability" (not a word you'll find in the dictionary, but used here for lack of a better term) and value. After years of throwing these terms about with similar abandon—but all the time questioning their real meaning - I'll offer my thoughts to you on what these words mean to me, and what may be the basic causal factors in determining collectability and value. The "LumberJack" would be proud! 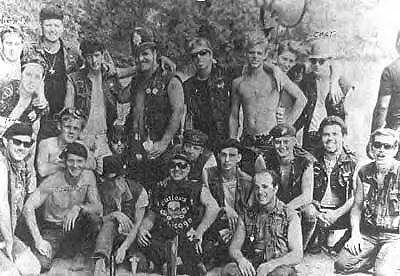 Now, I was not always a motorcycle person. I wasn't brought up around them and feel that I am relatively new to this sport - about 20 years or so. Aside from Evel Knievel showing up on my TV on Wide World of Sports on Saturday afternoons, I didn't know Jim Pomeroy from Mert Lawwill. Then I met my husband, Don, who always had motorcycles in his blood. He had show cars when I met him. Luckily, one day at the Englishtown Car Swap Meet, we found a 1930 Indian Wall of Death bike. 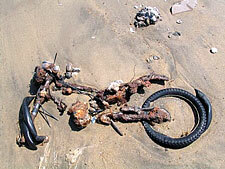 It reminded him of the bike that his Dad rode to get back and forth to work in Philly. So we borrowed the $1000 from Mom, which was way more money than we could think of scraping together back then, and that was it. You know, those ole' gut feelings that hit you in the pit of the stomach about the time you think of doing something different? Something out of the norm. I get those thoughts from time to time and the trick is knowing exactly when to listen to those thoughts. Sometimes I guess, you just need to listen to yourself. If you've been taking time reading this site for a while maybe you've read my first publication called “ My Story”. I was just jotting down thoughts one day about my motocross background, you know, kind of “ how did I get here “ story. If you happened to catch the last edition of McCookRacing you may have read about a dose of reality. 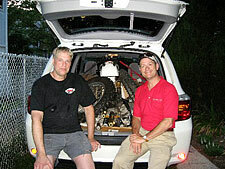 I have been racing with the Florida series for several seasons and have success finishing races. One of our fellow racers broke his leg badly in November. The injury put me to thinking about all the things that go into racing a dirt bike. I started writing down all the things that need to happen to have fun and successfully finish a race. 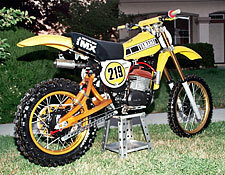 Imagine that you (Fred) bought that long sought after 1977 CR 250 Husky. Imagine now that you live in WV and the bike is in NJ. What to do, what to do? First, set up a work appointment in Philly. Second, rent a Toyota Highlander on the company American Express card. Third, plan to stop in NJ on your way home from Philly and forget to tell the boss that you are taking the long way home. 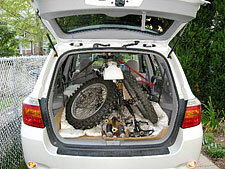 Now lower the rear seat backs and cover the whole back of the car with cardboard. Toss in an old comforter saved for just this reason. Now, throw that old clamped out Husky (do not read this Fred) on the stand and pull both wheels off. Aim for the open back hatch and throw Husky carcass into the back. 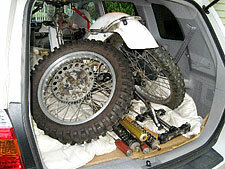 Use door handles as tie down points and stuff the extra parts into every empty spot left in the back. Feed Fred and send him off on his way. 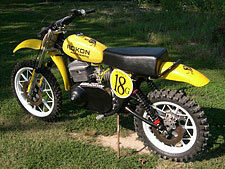 Rokon 340 MX 2 "Cobra"
The vintage movement has come a long way baby. In my twenty three years of involvement I've watched the sport evolve from being a fun yet minor fad into the multi faceted international maelstrom that it is today. 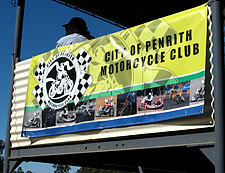 I've met the coolest people, built and raced bikes that as a young racer in seventies Australia I could only have dreamed about and traveled the length of my country and the USA racing and in my latter life gig as an ace reporter, chronicling the events, racers and motorcycles that make the world of the vintage off road movement so cool. 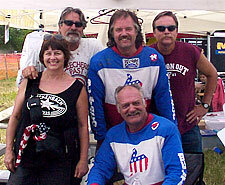 One of the most rewarding aspects of doing what I do is having the opportunity to meet the riders who were the kings of my motocross universe during the Wonder Years. Among others, I've interviewed and drank beer with Roger De Coster, bar hopped Santa Cruz's seedier taverns with Billy Grossi and drank Margaritas with Jim Pomeroy and Brad Lackey. I've discussed Maicos and prostates with Super Hunky and spent a weekend with Bugsy Mann. To a man, all of these icons have been genuinely nice people, all proud of their achievements but refreshingly normal. In April I added another legend to that list. I finally met the motocross icon to top them all, the great Joel Robert. 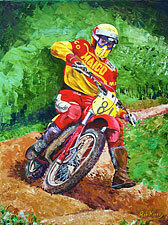 Last issue we unveiled the previously unreported tale of the 1969 reunion of motocross legends PJ Read, Nigel Holingsworth and their money man Trent Farlowe in far away Taiwan and the birth of their plan to bring pride back to the Taiwanese motocross industry (and themselves) with the Saipan GTR-X ‘Read Replica' 250 and Gemini NH360 projects... The story continues. After a fortnight of reliving past escapades and getting to know the hoi poloi of Taiwanese society, it was time for us to get down to work. Hollingsworth was unusually on top of his game and had set up a state of the art R&D and race shop in what had previously been the old Mayfair Hotels extravagant ballroom. The highly polished parquet dance floor that had once seen a generation of aristocratic British expats fox trotting away to then popular dance bands such as Jack Brindle and his Trocadero All Stars, was now home to row after row of stainless steel work benches fitted out with the best tools and equipment Taiwan could produce. The former cloak room now housed an engine dyno and the ladies toilet had become the quaintly named “Dremel Room” in which former Equipo Madre Trato tuning wizard Enrique del Vasquez Jr. wielded his exceptional spanner skills on race engine assembly. 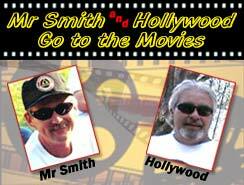 I took on the task of hand picking the race shop employees and I left no stone unturned in finding the best people. The name concept came to fruition at the second VMX Classic Dirt event in Kyneton, Victoria during a much earned between ride beer break. While sitting around whining and complaining about the disgraceful state of our beloved modern motocross and the downfall of vintage racing since they started allowing bikes with actual suspension, Freddy Mercury lookalike Alan Jones strolled into our beautifully appointed pit wearing his shiny new black Rickman Kevlar riding pants. Our old New Zealander mate Mike Jolly, ever quick to throw a sexual innuendo hardball, accused Alan of looking like a gay street crawler cruising for some tough boy leather bar action in his lovely black race pants. Alan quickly retaliated that he was actually looking for a Kevlar Bar. We all had a bit of a laugh, took another sip of Kozel and before the bottles were empty, Klub Kevlar was born. 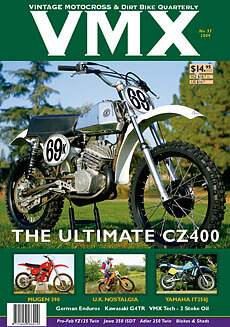 Your Mamma's next CR500! Yikes! In the previous bearing article we discussed the importance of using quality bearings and where to find them. In this installment I'll explain how to decode the numbering system currently used in rolling element bearings and provide some installation tips. To understand why different bearings are used in different locations on our bikes first we need to understand how fast the bearing is going turn and how much of a load it's expected to support. Bearing loads can be applied in the radial direction or perpendicular to the bore of the bearing. Bearings can be loaded in the axial direction, commonly referred to as thrust which is parallel to the bore of the bearing or a combination of radial and axial loading referred to as angular loading. It is no secret that the cost of racing has gotten a whole lot more expensive this season. At no other time has there been such a spike in race related costs. There are suddenly, “no close” tracks anymore, and one must decide to forego other expenses to just make it to the course. Many have cut back, and the regional and national attendance numbers reflect this reality. And it is not just AHRMA, it's everyone. “Practice Day” numbers are much lower, due to riders not being able to afford making it to the track during the week, and then again on Sunday. Modern events are down sharply, as well, and some folks who ride three classes, are now riding only one. At the modern nationals, attendance has dropped off a cliff. The combination of gas, the escalating gate fees, and the lack of competition, have forced the NPG to regroup. 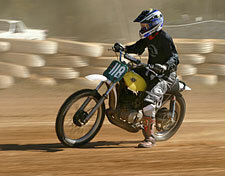 In 2009, these folks will see night races, and a possible one moto format. Tom DeSantis is the winner of the Cool CZ Racing Jersey! Caption: For Sale - Sight glass "eye" for autolube tank. Send us an email with your address and we'll get you this Cool Shirt! 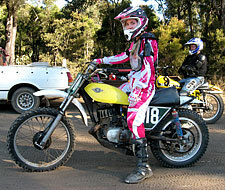 Kathleen Hutson age 17 on a tricked out '69 Suzuki TS250... She was kind enough to Sponsor me at the Nepean Charity Flat Track Race in Oz. What a Sweetheart! Thanks Kathleen!... and to all the Mates who made my stay a total Trip! 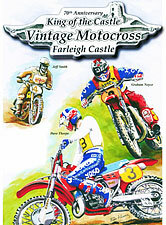 Photos by VMX's Ken Smith.